Butler's Mason Montag (24) goes up for a shot against Hampton's Josh Winek (33) during the Golden Tornado's 56-43 non-section win over the Talbots Friday night. Montag had nine points, all in the second half, to help Butler hold off Hampton. HAMPTON — Sophomore Mason Montag possessed something many of his Butler teammates didn't. He brought some quality play to the floor as well, scoring all nine of his points in the second half in helping the Golden Tornado to a 56-43 non-section boys basketball victory at Hampton. “We came down here tonight with a few guys not feeling well,” Butler coach Matt Clement said. “It's been that way the past few days. Luke Patten and Ethan (Morton) didn't even practice yesterday. Tarik (Taoufik) is under the weather and Doug Kostelansky didn't even make the trip. Senior guard Luke Michalek scored nine points in the first half, but was held out of the second half with a mild ankle sprain. “I didn't want to take any chances,” Clement said. Hampton (9-11) trailed only 25-19 at halftime and out-rebounded Butler 23 to seven in the first two quarters. Hampton 6-foot-4 junior forward Kyle Constantakis scored all 11 of the Talbots' third-quarter points and pulled his team within 27-25 with 5:30 left in the period. Montag completed a three-point play late in the period to extend a Butler lead to 37-28. He sank three lay-ups in the final quarter — giving the Tornado leads of 14 and 16 points — to help close out the win. “I want to be a team player and I knew I had to be there for my team tonight,” Montag said. “I figured there was a chance I'd get a lot of minutes tonight. I was ready. Montag had three rebounds in the second half as well. The Tornado (17-2) won their fourth straight game and head to Central Catholic Tuesday night with first place in Section 1-6A on the line. Both teams are 8-2 in the section. “This was a good team win. I like the way we executed down the stretch,” Clement said. Despite being under the weather and leaving the game briefly with a bloodied mouth, Morton led Butler with 19 points, seven assists and five steals. He hit all 10 of his free throws, including 8 of 8 in the final eight minutes. Taoufik had 10 points. Butler was out-boarded 37-19 for the game, but had only eight turnovers and limited the Talbots to one free throw all night. The Tornado were whistled for only eight personal fouls. “What we can take away from this game is experiencing playing against a very good zone defense,” Hampton coach Joe Lafko said. “We need to attack the zone better, harder. Hampton sank just four of 28 shots from beyond the 3-point arc. “You have to shoot better than that to beat that team,” Lafko said. Constantakis led Hampton with 15 points. 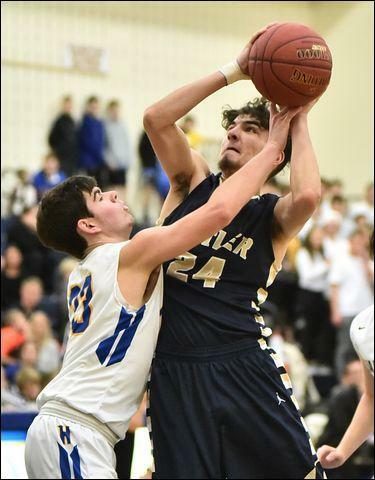 Isaac DeGregorio had 10 points, seven rebounds and three assists, Adam Bittner five rebounds and five assists. Hampton has a half-game lead over Chartiers Valley for the final playoff spot in Section 4-5A. The Talbots travel to Knoch Tuesday night, then host Mars next Friday. “We have to win one of our last two to get in, I think,” Lafko said. Ben Kranbacher got his first start of the year for Butler as the Tornado shuttled players in and out. Montag played most of the second half. Luke Michalek 3-4 2-2 9, John Mihalek 1-4 0-0 3, Mattix Clement 1-5 0-0 3, Tarik Taoufik 4-6 2-2 10, Luke Patten 0-2 0-0 0, Mason Montag 4-5 1-2 9, Ethan Morton 4-8 10-10 19, Isaiah Scribner 1-1 0-0 2, Nick Stazer 0-0 1-2 1, Ben Kranbacher 0-1 0-0 0. Totals: 18-38 16-18 56. Adam Bittner 0-6 0-0 0, Will Schuit 1-2 0-0 2, Isaac DeGregorio 4-15 0-0 10, Colby Mignogna 2-10 0-0 4, Ryan Dayton 2-4 0-0 4, Brandon Sickles 0-1 0-0 0, Kyle Constantakis 7-9 1-1 15, Josh Winek 3-9 0-0 8. Totals: 19-56 1-1 43.